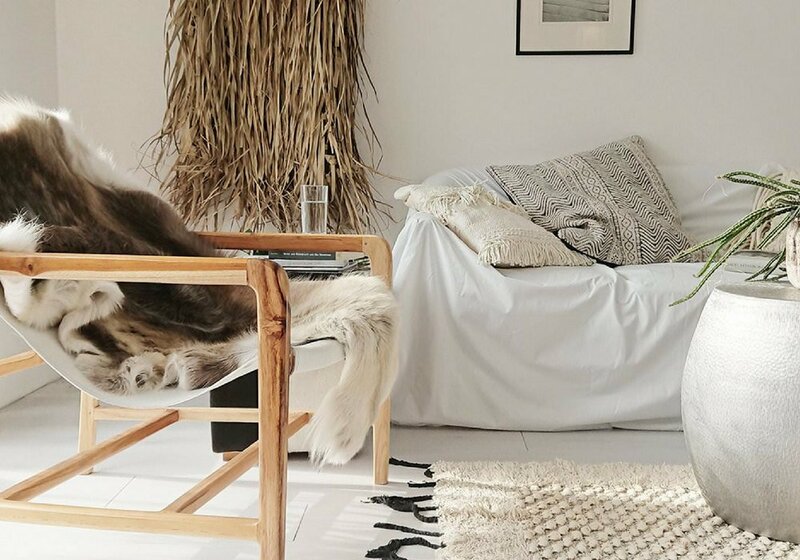 Souk Collective may have only launched in the UK in February this year yet they are rapidly building themselves a reputation as a go to store if you're looking to insert some cool boho vibes into your space. For a start they stock one of my favourite brand, Madam Stoltz, but the one place where they really excel is with their range of beautifully handcrafted furniture. Souk Collective ticks all my boxes from super cool designs to sustainability plus their pieces are surprisingly affordable! How did Souk Collective start? I was working in Auckland designing the interiors for old character apartments - mainly ex 1920s warehouse conversions with wooden floors, exposed brick, huge beams and columns etc. We were offering them fully furnished and I was having real trouble sourcing furniture for them that was bit edgy, well designed and made from natural materials (I'm not too big on plastic!) On the odd occasion that I did find the right piece it had a hideously huge price tag on it so I'd thought I'd source my own for a more reasonable price. I ended up finding really cool pieces from Indonesia and India that fit the bill and Souk Collective was born! I studied Visual Communication at Uni, then left for London on my OE where I worked as a barman, then later a change to landscaping in order to save what little remaining of my functioning liver! I met my wife Marnie shortly before I was due to return to New Zealand after 6 years in the UK and she came to NZ with me. I started out back home designing gardens and later moved into designing the apartment interiors. We'd been living in Auckland for 8 years (1 x Marriage, 1 x Mortgage, 3 x Kids, 3 x Cats etc etc) when I started Souk Collective a couple of years ago. Marnie was missing her family so we decided to return to the UK for an unknown amount of time last year and had a look at what was available in the UK in terms of the Souk Collective style and didn't find much so though we'd bring it over with us. I found a cool chick called Kate who had a sweet blog that was in keeping with our aesthetic and here we are! How do you select pieces? Basically I just find stuff that I like! We've got a certain style that celebrates natural materials like wood, leather and hides and stone. After the initial reaction to the materiality and the way the products look we then pass it through a second filter of function - is it comfortable? Is it usable? Although we like to think of them as statement pieces they need to be used everyday - not just looked at. Are interior trends important when selecting pieces? Not at all. We love travel and try to curate a collection that reflects that ethos of wanderlust. Natural or bleached wood reminiscent of a beach holiday or soft hides and textiles from a cabin on a ski holiday. We don't really subscribe to 'this season's hottest colour' or 'purple and gold is the new black'... Fads come and go with alarming regularity and cost but I think that a classic neutral palette and natural materials has a timeless quality to it. Gothic quarter of Barcelona or Fiji. I can't choose. The Gothic quarter for me is the perfect blend of relaxed Catalan cool, medieval streets, amazing food and a beautifully relaxed attitude to urban living. Fiji is a place where time just stops. The most friendly people in the world, white sand beaches on which sometimes you're the sole occupant. The chill 'Fiji time' vibe soaks into your very core and you generally just never want to leave the place! Do you have a favourite piece? Go and check out their website here or give them a follow on Insta here ! They are a really friendly bunch and would love to say hello!